Free tips and resources for stay at home moms who want to fight the frump on a budget. Cute outfit and clothing inspiration that is simple and easy for beginners! No previous fashion experience or style savvy required! In this post I'm telling you the reasons why using a waist cincher postpartum is a must for every mama postpartum. I'm also going into all the reasons I chose the one I did. But in case you want to get shopping right away, here is the one I use and recommendâ€¦. If closet chaos resonates with your current mom wardrobe situation, you're going to be encouraged by Sophia's story! Okay ladies, youâ€™ve all heard about the LuLaRoe craze thatâ€™s sweeping the nation. Itâ€™s become an absolute sensation among many women. Iâ€™ve often heard that once you try on their â€œbutter leggingsâ€� youâ€™re hooked. Based on my observation of women around me, I think thatâ€™s very true. And not only do they get hookedâ€¦ they become raving fans. You may have noticed that FLORALS are back. They were a trend in the 90's and today they're back but with a fresh twist. Find Out What's Missing In Your Mom Wardrobe! 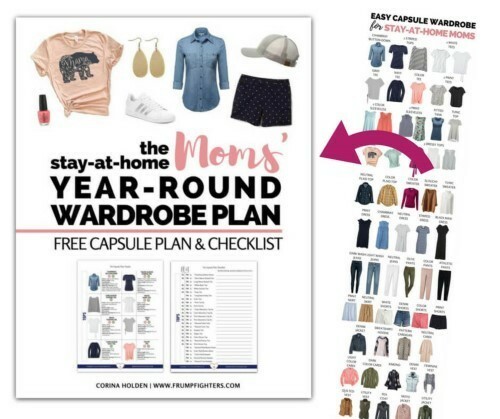 Download the free YEAR-ROUND Stay-at-Home Moms' Wardrobe Plan and learn the keys to having a chic wardrobe! I'm excited to send you some wardrobe and outfit inspiration, mama! Just one more step... check your email to confirm your subscription so that you can receive your download. How to NOT dress frumpy as a stay-at-home mom. A blog, community, and set of resources designed to make it easy to dress cute on a budget. Easy fashion and style help designed for all moms (pregnant, nursing, postpartum, and beyond). Learn more about mom capsule wardrobe plans at Frump Fighters. Pssst... Dear reader, I want you to know that this blog contains affiliate links. What's that? It means that making a purchase through one of my links may earn me a small commission. This is at no cost to you! It simply helps make this blog a possibility. Thank you for being here!